Understanding Solar PV Technology and how it can help your business save money. Solar Energy is the earths most available source of energy, working from both direct and indirect sunlight, this means that a photovoltaic system will still function on overcast days in Ireland will continue to generate free electricity for your business. 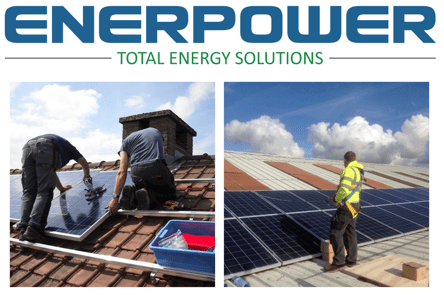 By installing Solar Power Systems in to your business, you are gaining huge electricity savings for your business and protecting yourself against the inevitable price rise from all energy suppliers. When asking yourself, how much are solar panels, it is important to know that financial incentives may also be available towards the installation cost of photovoltaic system for your business, this makes investing in this technology an attractive investment. 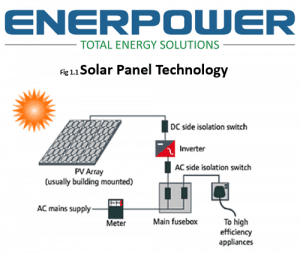 This technology works with a basic component known as a PV cell, often called a solar cell. See Fig 1.1. This solar cell will convert the sunlight into direct current , a solar power inverter is used to turn this current into usable electricity known as alternating current from your business. Meters are then used to show you the output of your solar panels. As mentioned above, PV Cells work on sunlight rather than heat from the sun and area the most efficient solar Panels. Ireland has the same annual irradiation levels as many parts of Central Europe, a good average for the entire country is 1100 kwhr/m2/yr. 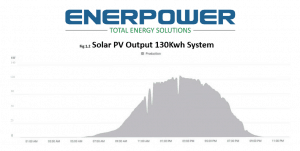 The output shown in Fig 1.2 below shows the output of a 130kwh system in Waterford, during May 2018. 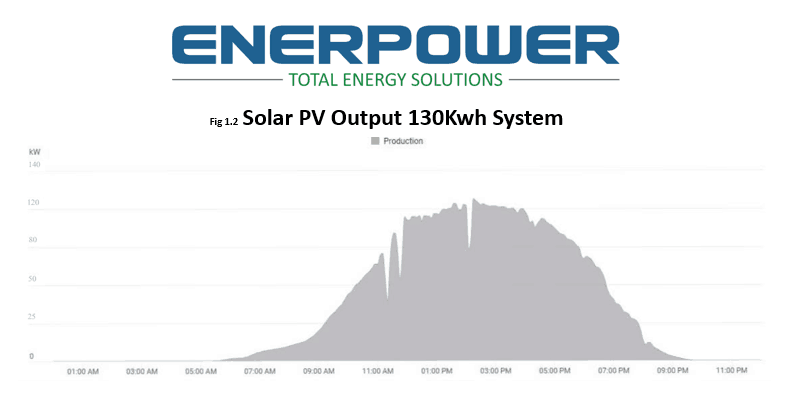 Almost at maximum output, this diagram shows how much free energy you can gain by installing Solar PV in to your business. The panels are simple to install, clean and highly effective. The Solar PV System is also the easiest way to meet the Irish Building Regulations Part L and to generate zero-emissions electricity. The Solar panel cost of installation is currently on a fast reducing track and is expected to continue reducing for the next few years, consequently Solar PV panels has indeed a promising future both for economical viability within your business but also with environmental sustainability. As PV panels have no mechanical moving parts, they require less maintenance than other technologies. You may also be eligible to add to your income by selling excess power back to the electricity board. It is important to note that solar PV is one of the major renewable energy systems that are promoted through government subsidy and grants, thus financial incentive for PV panels make this technology an attractive investment. Enerpower is the industry leader in energy efficiency and renewable technologies, delivering high quality products and services with an unparalleled sector knowledge guaranteeing your business energy savings. Founded in 2005, Enerpower is now one of Ireland’s leading renewable energy companies. We are committed to using biomass fuel, solar panel technology and wind energy to ensure businesses save money on heating an energy and also reduce the impact on the environment daily. By looking towards a photovoltaic system project for your energy requirements, you can reduce your energy costs as well as ensuring increased energy efficiency and promoting a positive green image for your company. Enerpower can carry out a detailed survey at your property and offer you a bespoke solution that suits your business and circumstances. If you would like to generate renewable energy for your business and be financially rewarded for doing so, contact Enerpower on 051 364 054.